The Ajax Spray N Wipe Ocean Fresh Trigger with antibacterial elements kills 99.9% of germs to provide a germ-free and clean surface. Its advanced formula makes it easy to cut through grease and tough stains and its fresh fragrance leaves a pleasant smell after the cleaning. 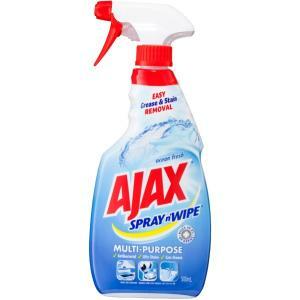 Applicable to a wide range of surfaces, this Ajax multipurpose cleaner is suitable for your office or home. This ocean fresh multipurpose cleaner is available in an easy-to-hold bottle with a spray for convenience of use.